Here is our contest site in Morocco. This QTH belongs to Stefano, IK2QEI – Matteo, IK2SGC – and Spiros, SV8CS. The locator is IM52JJ, CQ zone 33 and ITU zone 37. We are also using the special calls CN3A, 5D5A and 5F3COM. Special thanks going to AHMED,OMAR,SAAID (CN8WW) and all the guys of ARRAM for their big help to us. The rigs are a YAESU FT1000-MP, Mark V plus the Icom IC-756. Linear amplifiers by OM-power. In this foto can’t see our 4 square antenna for 80m. 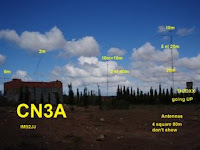 Hope to see you in the next contest from CN3A.